October 15, I listened to Energy and Mines Minister Bill Bennett provide detailed assurance that, unlike budgets of numerous BC megaprojects that suffered runaway costs, the $7.9 billion Site C dam budget was final, fully reviewed by specialists and reliable because it included a contingency well above prudent amounts. Nothing left to chance, uncertainty or politics because number were developed by the world’s top experts. Well, that was then… this is now. would have mentioned it in his speech. Liberal spokesman Vaughn Palmer is explaining that “$8.5 billion is within the range of the revised cost estimate.” Put simply, in two months, costs escalated $600 million, a rate of more than $10 million a day. Remember the years of proMedia outrage after a different Premier named Clark offered assurances that the cost of fast ferries would be $210 million, “right down to the toilet paper.” He was wrong… to the tune of about $240 million. Today, top news at The Province Online includes “how to book the cheapest airline flight,” a Calgary man’s claim that bigfoot DNA had been “plucked from a BC tree” and a report about an Afghani Bruce Lee lookalike. With keen perception of a man certain of the road he follows, Bennett recognizes uses that might overwhelm present generating capacity if a ten or fifteen billion dollar commitment to Site C is not made. In the same speech, he admits that Site C would provide power for mining and gas projects but he failed to mention that the established industrial rate would be less than BC Hydro’s costs, either from Site C or its many private power suppliers. The eventual amount of that subsidy remains a matter of negotiations that will affect whether proposed LNG projects go forward. With large up-front infrastructure costs, negligible gas royalties and no LNG taxes until operators declare all costs are recovered, BC taxpayers should hope Liberals soon propose a different reelection strategy. Since government has not made arrangements with First Nations, it will have difficulty arguing that negotiations were meaningful if the project launched prior to completion of agreements. The strategy is to pretend a “final investment decision” is not yet made. Therefore, all activities complete or underway are without cabinet approval and no costly project is certain without authorization from the highest level. Sure, the committed public investment measures in the hundreds of millions for design, engineering, assessments and approvals. The Petronas deal is done and it has been promised cheap, secure power. The Site C pre-construction phases is substantially complete; if it were not, Bennett wouldn’t have a “reliable” final budget. They have environmental certificates issued after a lengthy process and BC Hydro is involved in contracting for worker accommodations and site preparation. By every practical measure, Site C is underway. Calling an end to the enterprise would result in huge losses that would not be “what’s best for ratepayers in the province.? H/T to RossK at The Gazetteer for pointing the way to Vaughn Palmer’s column. With Ontario currently negotiating the sale and subsequent privatization of Ontario Hydro, right after their ill advised nearly two billion dollar boondoggle with overpriced and inefficient 'smart meters',( http://www.goldstreamgazette.com/national/285267291.htmlI) I have no doubt that our band of malfeasing miscreants have a similar agenda with some of their 'friends' to do the same with BC Hydro. I suspect the 'buyers' won't close the deal until Site C is completed and guaranteed to be paid for by us via a P3 scheme in concert with their favourite constructor SNC Lavalin and much backroom input from Encana and their former expat CEO. 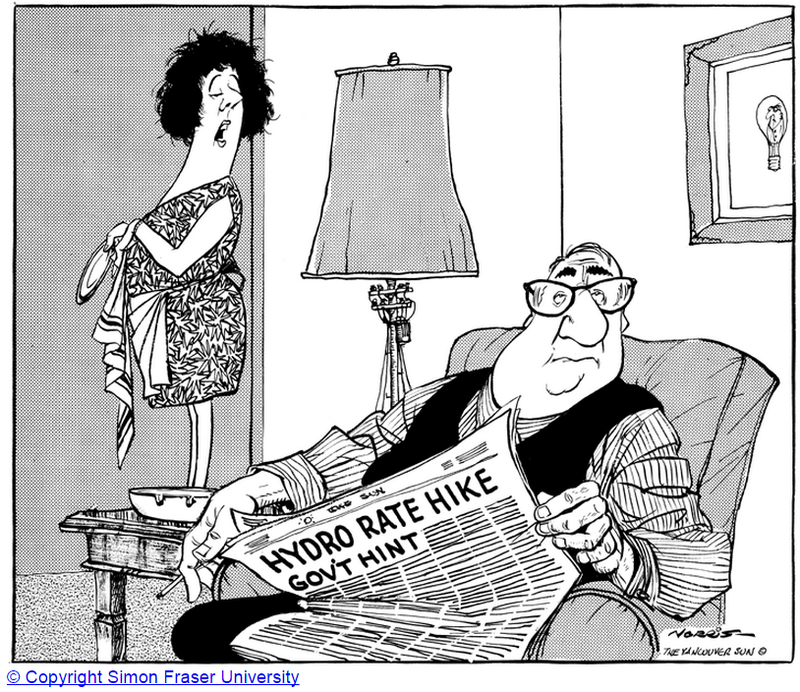 Any article is improved when a cartoon drawn by Len Norris is added and thank you for linking to the The SFU Library Editorial Cartoons Collection. Many delightful items there! This material, and the rest of what appears here is so good that it's hurtful. Carry on. Bill Bennett is both a lawyer and a politician. Training in both lines of business demands support and advocacy of positions that may or may not be authentic. Bennett doesn't worry about justice, truth and accuracy. He wants to make debating points that uninformed listeners might accept as correct. If we believe him, it is because we want to believe, not because we've verified the information.